I will work on a reward basis, what is worth to you to have me find your lost or hidden items and what you can afford. There will be a call out fee, for auto expense depending on the distance traveled, if the item is not found. Beaches, Parks, Lakes and Houses. Assist Realtors and Homeowners before selling their homes by searching yards and inspecting homes in attics, basements and ductwork for forgotten treasures and articles that would normally be left behind once a house is sold. 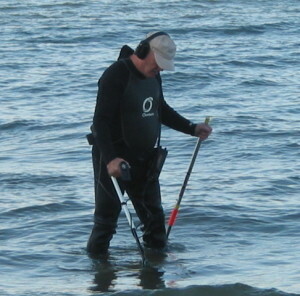 Detecting since 1977 while in Okinawa, Japan. 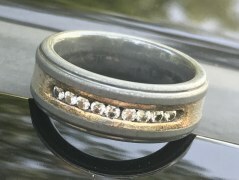 Assisted in finding over 70 rings and have over a 90% success rate. I am President of the West Michigan Wolverine Research and Recovery Club and a member of the Southwest Michigan Seek and Search Club. Thank you! Thank you! Thank you! The diamond belonged to my grandmother so is an antique, so could not have replaced. You are an answer to prayer. Very thankful that I was able to find someone to retrieve my ring. 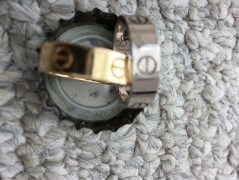 And a bonus found my daughters ring aswell.. I thought it was a gonner and a long shot to Google jewlery recovery…. I would recommend these two to help find any lost jewlery.. and they were very friendly also!! My name is Dennis Pittman and I am the husband of Megan. 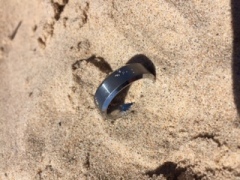 A few days ago you and your crew shocked us all by finding Megan's ring at Hess Lake. I just wanted to take a moment to personally thank you for your hard work and dedication to find Megan's ring. When Megan called to tell me know her ring was lost we were all devastated and the thought of finding it never even crossed my mind. The next day was pretty rough trying to decide what to do next while still trying to figure out exactly how something like this could happen. After hearing that you and your crew would be attempting to find the ring I honestly wasn't sure how it would go. A big cloudy lake with a small ring just seemed like too difficult a task. However, after the first day of searching when Patrice told me how convinced you were that you would find the ring, my spirits started to change. 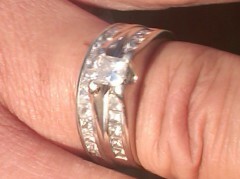 I was shocked, amazed and so thankful when I got the call that the ring had been found. 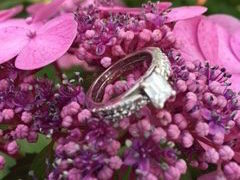 We now have an incredible story to share rather than a horrible memory of a lost ring. Thank you again for bringing joy and laughter back into the family after some disappointing days. Your services and dedication are invaluable. Gregg, thank you again so much. I am still at a loss for words and cannot believe that you found my rings yesterday. I prayed so much and the entire time.... it didn't even feel real! You are a hero to me and the perfect example that if you pray hard enough, God will never let you down, and I owe so much of my happiness right now to you! I feel like I am the talk of my community right now.... Everyone is STUNNNED! I don't think I can say thank you enough. All I have to say is keep doing what you do! I cannot even imagine how much happiness you have brought to people since you have been finding rings. My entire family and friends loved reading your blog post. You said such kind things about my parents and I want to thank you for that as well. I am so happy you enjoyed my moms food (that is my favorite dish she makes!) Thanks again Gregg, and take care. Gregg was absolutely the best! I don’t know what I would have done if it weren’t for theringfinders.com! My name is Jill, I'm Russ' girlfriend who you met out in East Lansing yesterday. I just really felt the strong need to thank you myself for the amazing work you did. The ring you located has invaluable sentiment to me. 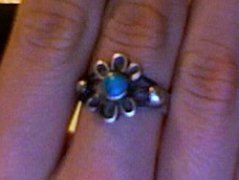 It belonged to my grandmother, who passed away last September 1st, 2011. Her and her best friend, Ann, got these matching rings in high school. And although it may not be worth more than a few dollars, it means the world to me. Losing it was devastating, and every time it has crossed my mind in the past three months since it was lost, I have gotten seriously upset. Seeing that ring yesterday gave me a different reason to cry, I couldn't believe it when I saw it. I still can't believe it! I would like to truly thank you from the bottom of my heart for your perseverance and dedication to your trade. I'm amazed, I can't thank you and Russ enough for the greatest surprise EVER. We'll be sure to keep your information, and share it with high recommendations. I am just amazed at how typing “how to find a gold ring in grass” into my search engine, led me to this website, and better yet to someone local who was able to find my ring in minutes. I don’t think I can explain the feeling of relief I felt once that ring was back on my finger, from 10pm thurs to sat 905 am was a long time to hold my breath. 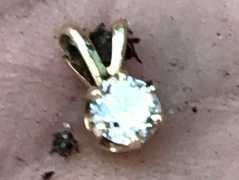 I was chicken to call for help, but determined to find my ring; and I am surprised how quickly this has been resolved, Gregg responded so quickly to give up his Saturday morning and watching him work seemed so effortless, within minutes he was holding my treasure. I was afraid my ring would become another lost treasure on the farm and now I am so happy to have it back where it belongs. Thank you, thank you, thank you. I’ve always said that my husband would give me the moon if he could and I feel that way right now about having my ring back. Priceless for sure.